Conversations with physicist Ralf Jungmann demand a great deal of concentration. He takes one at a sizzling pace through a world that is inconceivably minute, a world which, according to the laws of optics, is not directly accessible to even the best light microscopes. It is also the microcosmos in which biological processes are at home. Its denizens are the metabolites and macromolecules whose interactions determine the course and the limits of our lives – and we still know very little about it. But Ralf Jungmann's ambition is to bring every molecular machine in the cell within the purview of light microscopy, a task that inevitably leads him to the frontiers of the physically feasible. Together with his 11-member team, Jungmann, who has just been appointed to a professorship at LMU, is developing a so-called super-resolution microscope for biomedical applications, which is designed to image cellular structures with the aid of DNA-based labeling techniques. The project has received funding from highly selective grant programs run by the Deutsche Forschungsgemeinschaft (DFG) and the European Research Council (ERC). The field of super-resolution microscopy has become quite crowded in recent years, and a great deal has been achieved that seemed impossible not so long ago. Jungmann (35) reels off the acronyms of the new techniques that have emerged, from STED, STORM and PALM microscopy to the fascinating Lattice Light Sheet microscope, which scans cells systematically level by level. As the listener wonders how these various approaches differ, Jungmann remarks with a laugh: "In principle, they are all very similar to one another." In moments like this, one realizes that this off-handed familiarity is the product of hard work and hard thinking – given that one is dealing with methods that lie on the very edge of current technology. Less than 2 years ago, in 2014, physicist Stefan Hell in Göttingen shared the Nobel Prize in Chemistry with the Americans Eric Betzig and William E. Moerner. All three had found ways to bypass the classical diffraction limit and enhance the level of resolution of optical microscopy by up to 10-fold. Since then, they have extended the limit still further, into the nanometer region. "My goal is to boost the resolution of fluorescence microscopy by combining it with tools from the world of DNA nanotechnology, such as DNA origami, to prepare highly specific fluorescent probes," Jungmann explains. By this means, one can attain a level of resolution which permits one to visualize structures at the molecular level. 'DNA origami' is another term that keeps turning up in the nanosciences. By analogy to the Japanese word it borrows, it refers to the art of creating patterns and three-dimensional structures – not from a sheet of paper but a set of DNA strands. To understand complex biological systems, one must be able to explore the nanoworld. However, conventional light microscopes cannot penetrate into this realm, because the law of optical diffraction restricts resolution to structures with dimensions of around 200 nanometers (nm). This precludes subcellular localization of the proteins that provide the catalysts, receptors and structural scaffolds essential for cell function, as many proteins are only a few nm across. "I want to develop technologies that will help us to solve biological problems," Jungmann says. "My aim is to visualize at the highest possible resolution hundreds – no, thousands – of the components in cells, whether proteins, genes or RNA molecules. And I want to make the technique so simple that a normal laboratory anywhere in the world can use it." Those are lofty goals, but Jungmann has made considerable progress towards realizing them. As a student and post-doc, he received several awards and fellowships, from the German Academic Exchange Service and the Humboldt Foundation. He developed an interest in the nanoworld while writing his Diploma thesis (on the effects of strain on the fine structure of human bone) at the University of California in Santa Barbara, when he came across a paper by the American researcher Paul Rothemund. The study described how DNA strands with defined sequences could be used to self-assemble into nanometer-sized patterns and figures, including the iconic smiley. "I found it absolutely fascinating." Jungmann returned to Germany and joined the DNA Nanotechnology Laboratory led by Friedrich Simmel, Professor of Bioelectronics at the Technical University of Munich (TUM). "We pioneered the technique of DNA origami in Germany," he says. Jungmann soon realized that tools from the world of origami could be utilized for microscopy. With his newly acquired expertise, he returned to the US to join Harvard. DNA origami provides a method for building nanostructures that can serve as docking stations – rather like the holes in an electronics breadboard – for molecules such as fluorescent agents that be visualized by microscopy. Jungmann is now focusing on the development of new fluorescent tags, whose emission characteristics can be tightly controlled and differentiated – all in the service of increasing optical resolution. "The decision to come back to Munich and specifically to LMU was an easy one," he says. "Universities and Max Planck Institutes (MPIs) offer ideal conditions for research." His CV reads like a model of careful planning, and it tells a success story. He is co-founder of a company in the US, and holds a dozen patents – an impressive record for a 35-year-old. "It looks like plain sailing in retrospect, but in fact much depended on incidental encounters and decisions based on instinct." But then, following one's instincts in choosing labs where one can learn something new, and recognizing trends that promise to become "rocket science" or simply offer a stimulating environment for teamwork is itself a kind of plan. Jungmann currently heads an Emmy Noether Junior Research Group in the Faculty of Physics at LMU, and the MPI for Biochemistry in Martinsried. He recently won one of the highly endowed Starting Grants awarded by the ERC, and a grant of a million euros from the Max Planck Foundation. A visit to his lab at the MPI suggests that this money is being well spent. Here one finds the light microscope with the highest resolution – 5 nm – currently attainable anywhere in the world. It is basically a classical fluorescence microscope, but with innovative modifications designed and built by Jungmann's group. 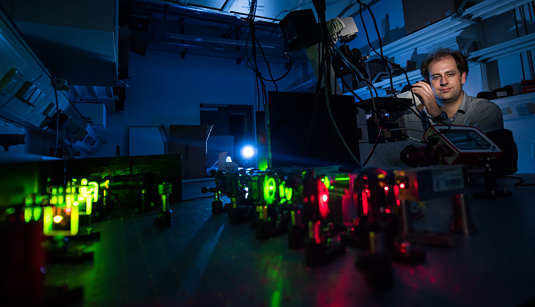 Laser, mirrors, objectives and cameras come from commercial sources, but his coworkers are responsible for the overall conception of the instrument. This is one reason why interdisciplinary collaboration in well integrated teams is so important. "We can move faster because communication is simpler and coordination easier – and we make fewer mistakes because we have experts for all the details," Jungmann explains. Factors such as these help to explain how one can make such rapid progress: Ideas are freely exchanged and can be speedily assessed and implemented. Jungmann belongs to a new generation of researchers in Germany who have learned to work as members of networks. These transparent and cooperative structures have replaced the hierarchically organized and inward-looking systems of yesteryear. Jungmann learned how productive this approach can be when he joined the laboratory led by William Shih and Peng Yin at the Wyss Institute for Biologically Inspired Engineering at Harvard Medical School in Boston. The Institute employs specialists in all relevant disciplines, from mechanical engineers to biologists and computer scientists. And this is the model he himself sets for his doctoral and Master's students. For example, he spent 30,000 euros on a simpler version of his record-breaking microscope solely for their use – designed by one of his PhD students. "It gets down to 20 nm," he says. "Not bad for a do-it-yourself job." Three of his doctoral students did their Master's under his supervision when he was still at Harvard. That extends their network of international contacts, "and having successfully gone through the Harvard mill is a recommendation in itself," he adds. These graduate students now form the experienced core of his team, something even the best group-leader can't do without. It also means that ideas for projects are never in short supply. Jungmann has high hopes for his DNA barcodes, which can be targeted to a plethora of specific proteins and RNA sequences, serving as unambiguous markers for each. These markers are equipped with photoswitchable dyes which, depending on their precise structure, blink on and off for shorter or longer periods, and with tunable intensities. "Our method is simpler than all other modes of super-resolution microscopy," Jungmann asserts – and he is thinking here not only of imaging individual cells but also cell collectives in tissues. In fact, it is possible to observe and analyze hundreds of cells at a time using short, dye-labeled DNA strands as highly specific beacons. The funds made available by the Emmy Noether Program and the ERC Starting Grant, together worth some 3.5 million euros, provide him with the scope to pursue his dream for the next several years. In addition, LMU now offers ERC Starting Grantees tenure-track professorships (W2) and Jungmann is among the first to profit from the scheme. On August 1st he became Professor for Molecular Imaging and Bionanotechnology. "That gives me a degree of security, though it does not guarantee that I will later obtain an academic chair," he says. His work will be reviewed in 5 years' time. "And that is of course a further incentive for me," he adds – with a grin.